The adjustable seat spacing demonstration unit with seatback computer screen that shows the available options and combinations. 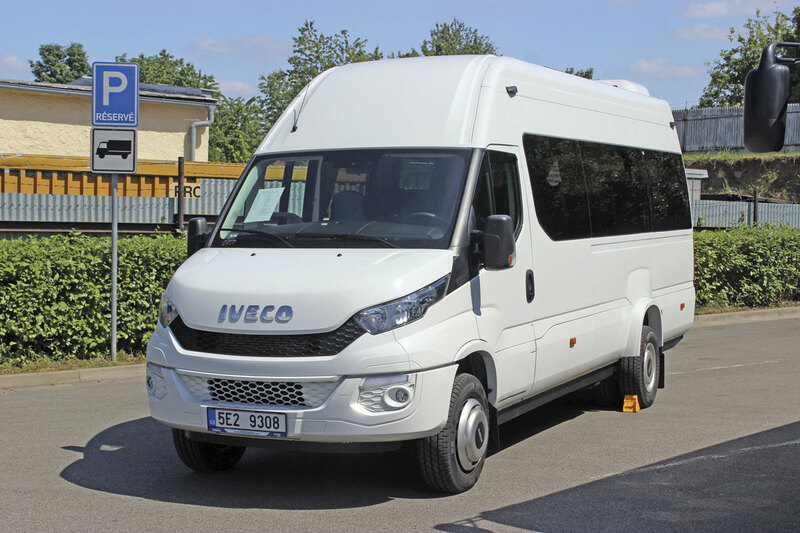 Iveco Bus is one of the major European players though its presence in the UK market has latterly been limited to minibus versions of the Daily commercial range. Earlier this month, Stuart Jones was invited to visit the company’s biggest large bus producing plant, the former Karosa factory at Vysoke Myto in the Czech Republic, for celebrations to mark 120 years since Josef Sodomka started the business that became Karosa. The trip enabled me to see the investment that has been made at the plant and the new Bus Design Centre, but also gave me the opportunity to talk to senior directors, including Pierre Lahutte, Iveco Brand President for CNH Industrial and Sylvain Blaise, Head of Global Bus, about Iveco’s position in the UK market. There have been very significant structural changes within the group in recent years. 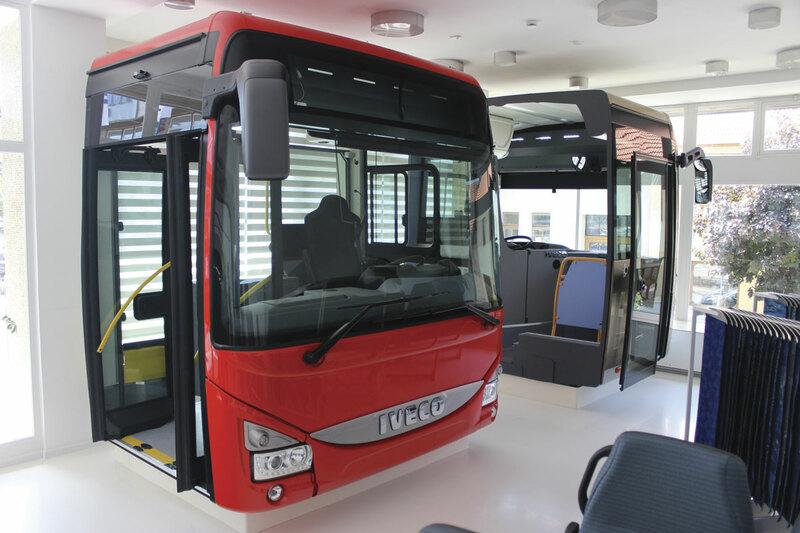 The former Irisbus name used for Iveco’s bus operations has disappeared and is now Iveco Bus, which is itself one of the divisions of the CNH Industrial Group which boasts 12 different brands within its portfolio. CNH Industrial employs 69,000 people worldwide, has 69 plants with 49 R&D centres and had a turnover of $32.6billion (£20.89billion) in 2014. The CNH name derives from Case-New Holland. It has a massive presence in global agricultural and construction markets. Another division is Fiat Powertrain Industrial, a global leader in engine and driveline component design and manufacture, with ranges including the Tector and Cursor. It has pioneered the SCR only approach, eschewing EGR technology for Euro6. Its products are to be found powering CNH group vehicles, as well as those of some other manufacturers. Straight talking and energetic, Pierre Lahutte became Iveco Brand President last year after a two year spell as the head of the global bus division. As a result he is very familiar with all aspects of Iveco’s bus operations though his remit now includes the vast truck and light vehicle portfolio. He previously had roles within the agricultural elements of CNH Industrial’s constituents. Heading both CNH Industrial Group and Fiat Chrysler Automotive Spa is the Italian-Canadian, Sergio Marchionne. The Vysoke Myto plant is a large one covering more than 225,000 square metres. 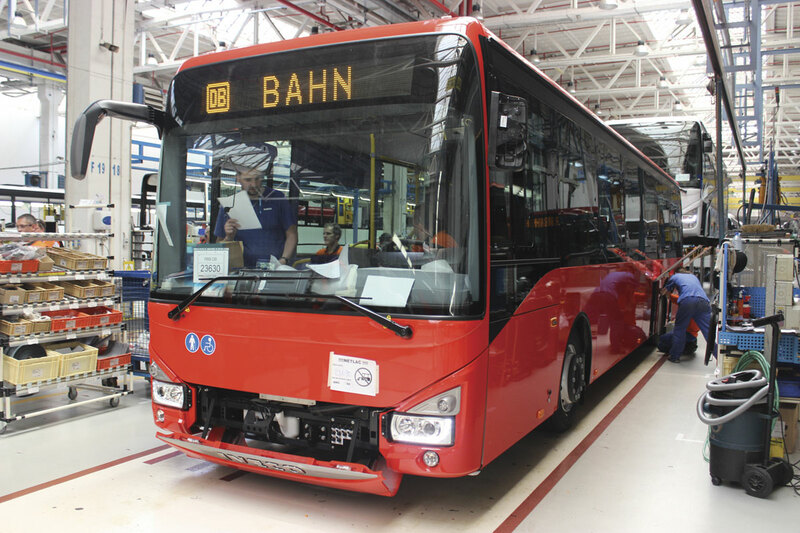 CNH claim it is the largest commercial vehicle production complex in Central and Eastern Europe and one of the major bus production facilities in Europe. 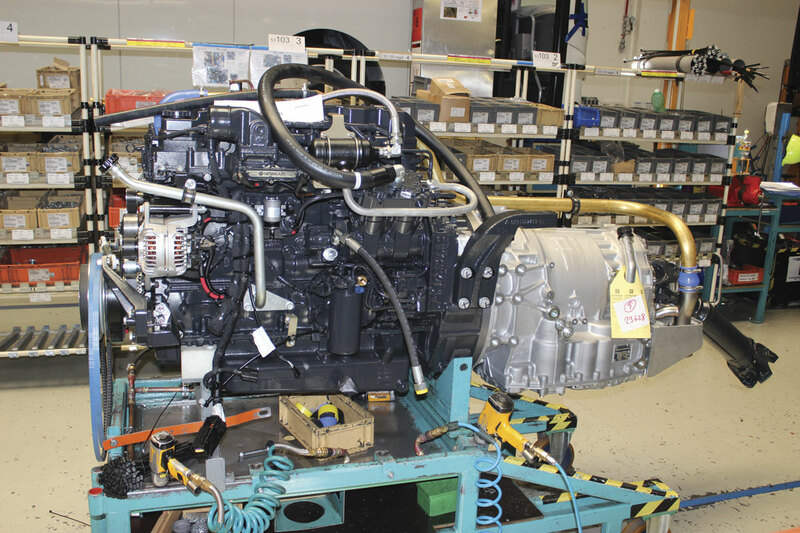 Iveco Czech Republic employs over 3,000 people at the plant in addition to another 1,700 subcontractors. 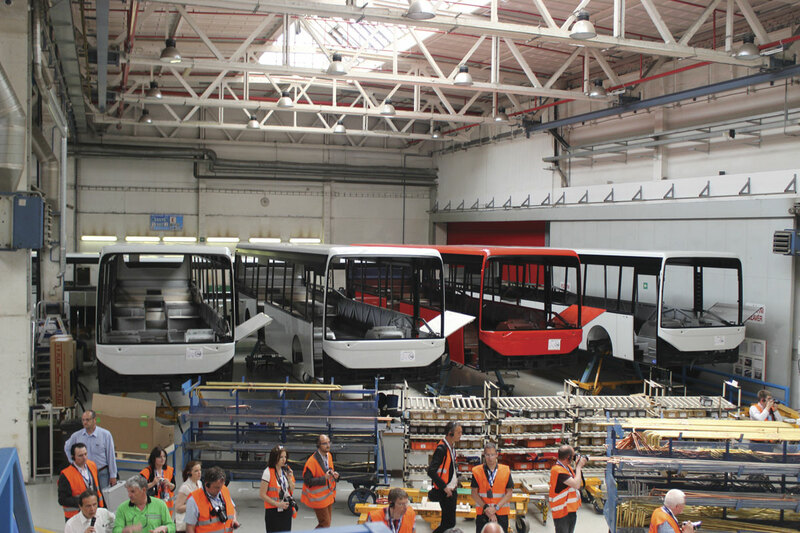 Annual production in 2014 was 3,288 buses, 94% of which were for the European market, with France, Germany, Benelux, Slovakia and Italy among the biggest markets. 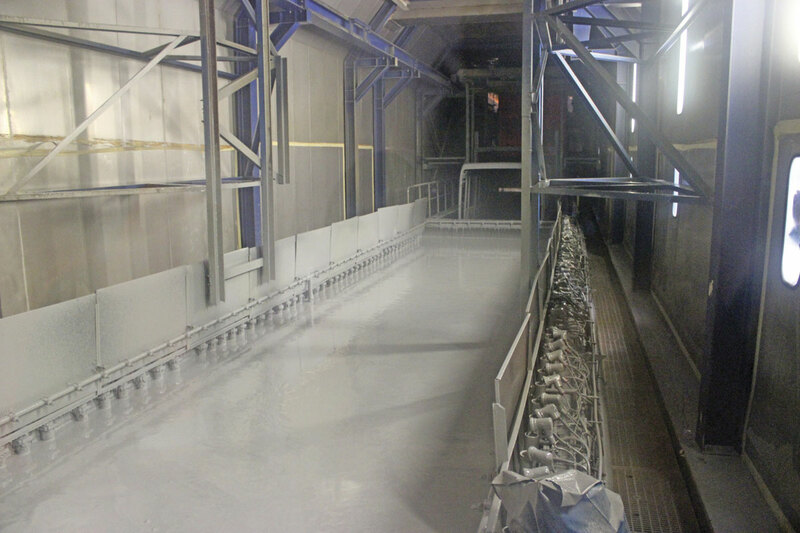 Located on the same site since it was founded, the Vysoke Myto plant has seen huge investment, significant among which was the installation of a full emersion cataphoretic dip facility to ensure protection of a vehicle’s entire structure. Touring the facility it was noticeable how much it has moved on since my previous visits with a lot more computerised machinery, including laser controlled equipment. It was also extremely busy, with not a spare production space to be seen on the lines. These can cope with an infinite mix of different product, so you see low entry Crossways, standard Crossways and short Crossways interspersed with Urbanways and CNG powered Urbanways as they pass through the plant. 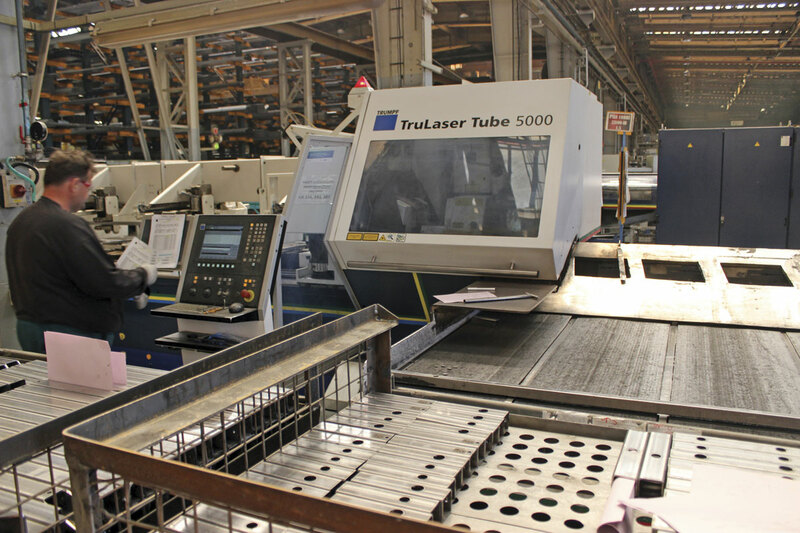 As well as manufacturing complete vehicles, Vysoke Myto makes components for other Iveco plants. These include welded sections such as engine frames and electrical harnesses. It also makes seats on a grand scale offering a number of ranges. Seat production in 2010 was 110,812, rising to 134,217 in 2012 and 168,012 in 2014. 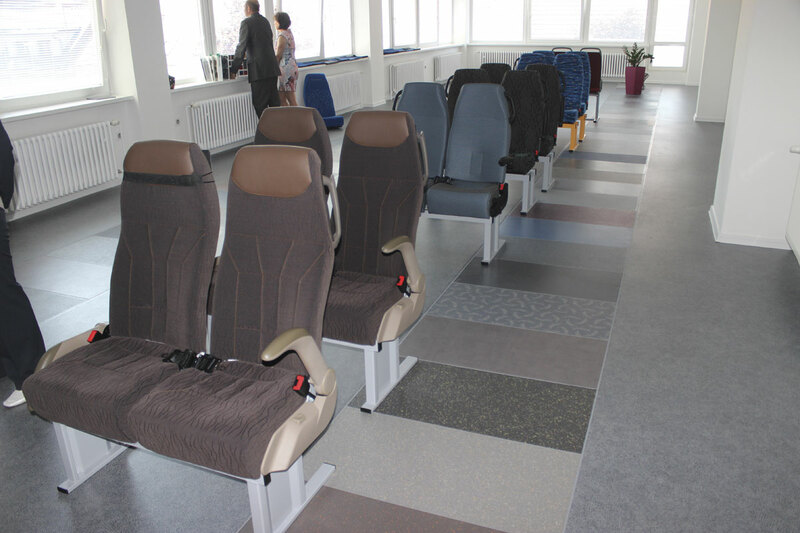 Arranged on two floors, the ground floor has two complete bus front sections that enable buyers to specify exactly what they and their drivers want in terms of layout. 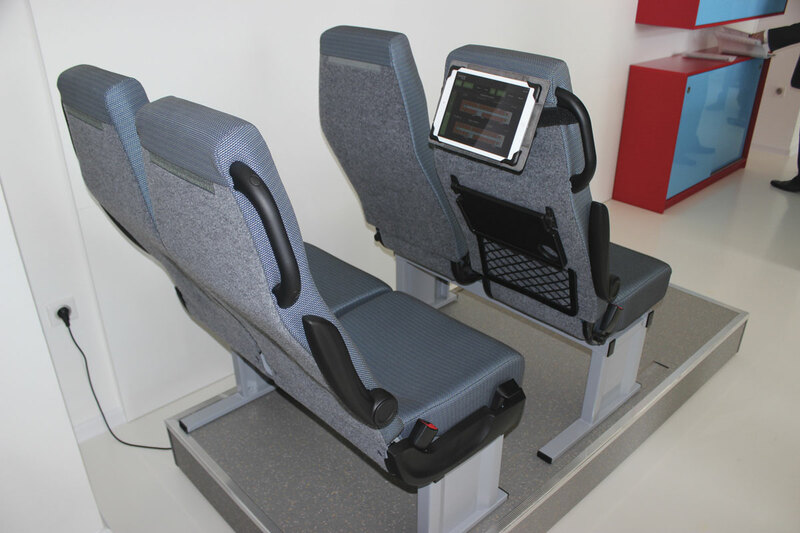 There is also a fully adjustable seat section that allows seat spacings to be accurately demonstrated and, built into the rear of one of the seats, a computer display that shows the seats available and what models and of which lengths they can be fitted in at 680m, 710mm and 730mm spacings. Trim materials are displayed and there are computers that can illustrate how any combination of materials and seats will look in practice. Upstairs the full seats range is displayed along with floor covering materials which are set into the floor to better illustrate their physical appearance. 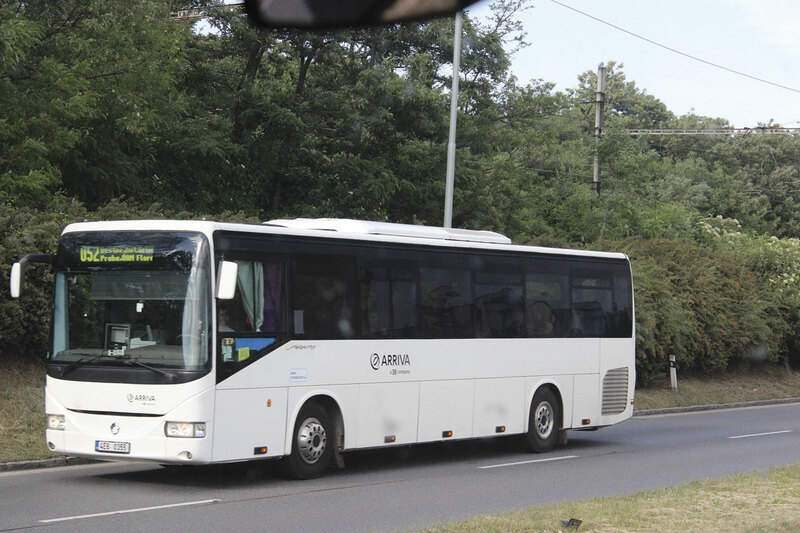 The Jewel in the current Iveco Bus product line-up is the Crossway, which is Europe’s best selling inter city coach. Over 24,000 have been built to date in its various guises. Originally launched in 2006 and developed since, all versions are exclusively manufactured in Vysoke Myto. Nicknamed ‘The Money Maker’ internally, it is offered as both a step entrance and a low entry vehicle and can be supplied on two axles at lengths of 10.7m, 12.1m and 13.0m. As well as conventional coach style entry arrangements there is a Low Entry version with a 265mm high entry height. I was told that Crossway is the only 13m two-axle intercity coach to offer a 63-seat capacity. Two engine options are available. The higher output unit is the Cursor 9 with the Tector 7 unit also offered as an alternative. Both ZF and Voith transmission options are offered. All told, there are some 30 engine/gearbox combinations available. We were told during our tour of the facility that additional members of the Crossway range are under development that will further extend its appeal. One of these is a CNG powered version, gas power being a technology that Fiat Powertain Industrial is particularly accomplished in. 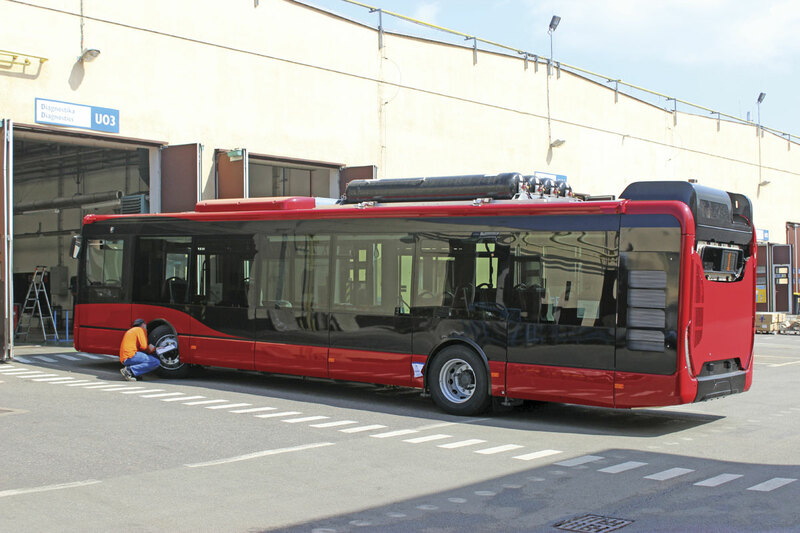 The Crossway will have the 7.8-litre Cursor 8 290/213kW vertical CNG unit also utilised in the CNG powered Urbanway. Another development will be a high deck Crossway, and I understand three-axle options are also on the cards. To me this is an interesting pointer to the way Iveco Bus’s thoughts are going in the future. We have seen other manufacturers abandoning some top of the range models because there are not the numbers to justify the high cost of developing them and building them in relatively low numbers in specialised plants. An HD Crossway might, and this is only speculation, offer the opportunity to sell a higher specification coach with a relatively low cost base, thereby enabling a competitive price to be offered. The attractive French built Magelys remains in place covering the limited sector at the top end of the market. Although, to my knowledge, there are no Crossways running in the UK, they have been purchased in considerable numbers by Arriva, which operates them in seven countries. These include Slovakia, the Czech Republic, Italy, Spain, Denmark and the Netherlands. Arriva’s parent company, Deutsche Bahn, placed one of the most significant Crossway orders ever, calling for 700 units over three years for its German operations. It was this order that originally prompted Iveco Bus to develop the German style VOV dashboard for the model. I understand that across Europe, 8.34% of the Arriva fleet is of Iveco manufacture, a total of some 2,169 buses and coaches. 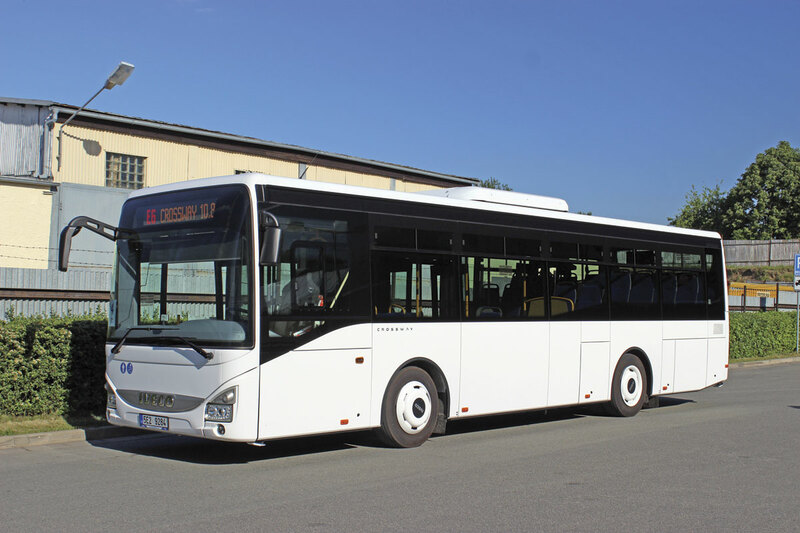 Incidentally, Arriva’s Italian arm has just taken delivery of seven biomethane CNG powered Iveco Urbanway buses that, along with two minibuses, will be providing all of the on site shuttle services within Expo 2015 in Milan, the international expo that started on 1 May and will run until the end of October. 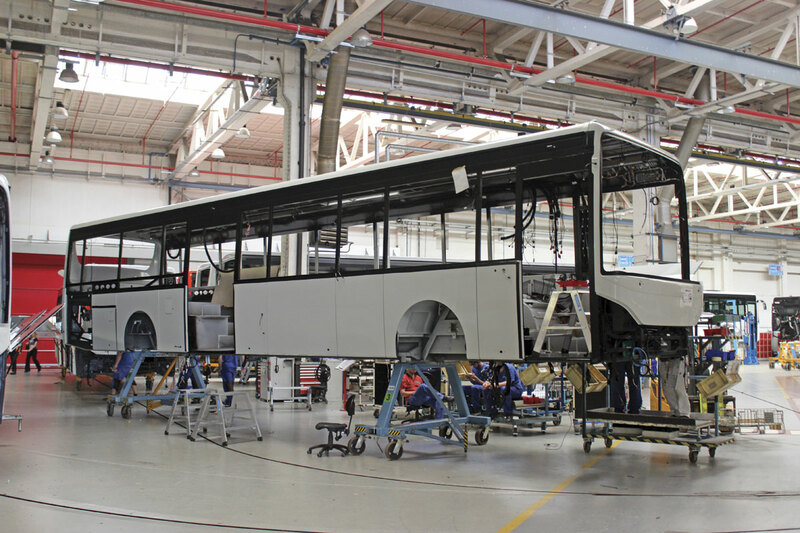 The Urbanway, Iveco’s latest city bus generation, is also produced at Vysoke Myto, as well as at the Annonay plant in France, where the Magelys luxury coach range is produced. 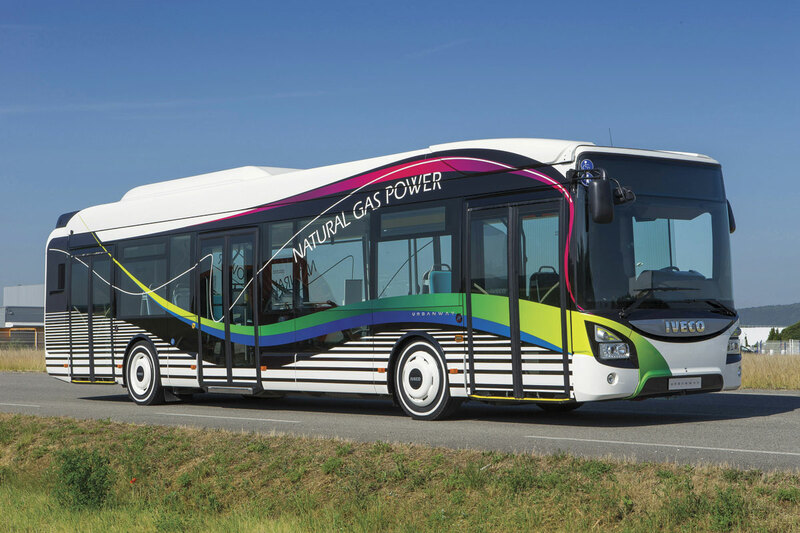 Iveco Bus offers hybrid versions of the Urbanway and, like Alexander Dennis in the UK, works with BAE Systems to do so. Asked about Euro6 chassis for the UK he said that Iveco Bus had exited the (large bus) chassis market. He believed it was ‘questionable’ whether a manufacturer could guarantee Euro6 compliance in a chassis body combination. He was absolutely convinced that FPT’s decision not to embrace EGR technology was the right one. ‘You burn to clean – it cannot work. I think everyone will try to go SCR only,’ he said. Sylvain Blaise is Head of Global Bus for CNH Industrial, a role that includes the Iveco Bus and Heuliez Bus brands, and he echoed Pierre’s view. The end of the year may prove a bit ambitious with the restructuring that is taking place as Iveco’s UK operations, quartered for so many years in Watford, will be relocating to Basildon in September where New Holland has a large plant manufacturing agricultural machinery. 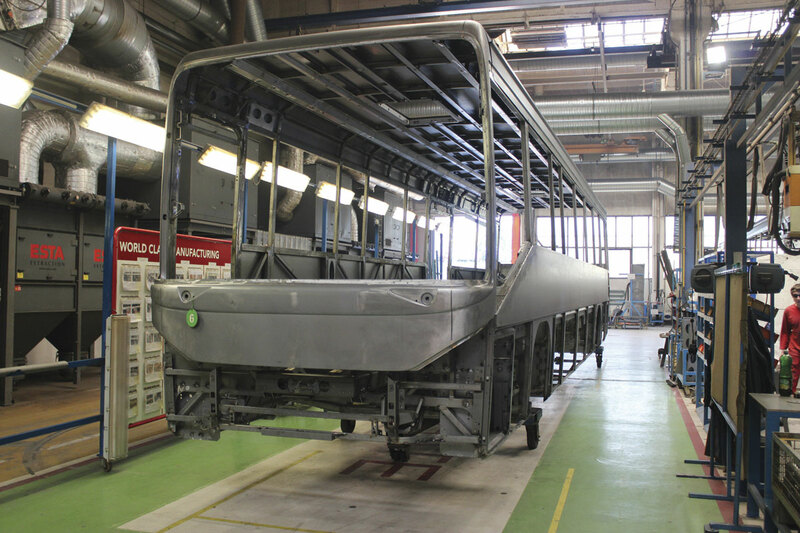 Although complete factory built UK-specification minibus versions of the new Daily have not yet been launched, it is already possible to order chassis cowls for body on chassis versions. 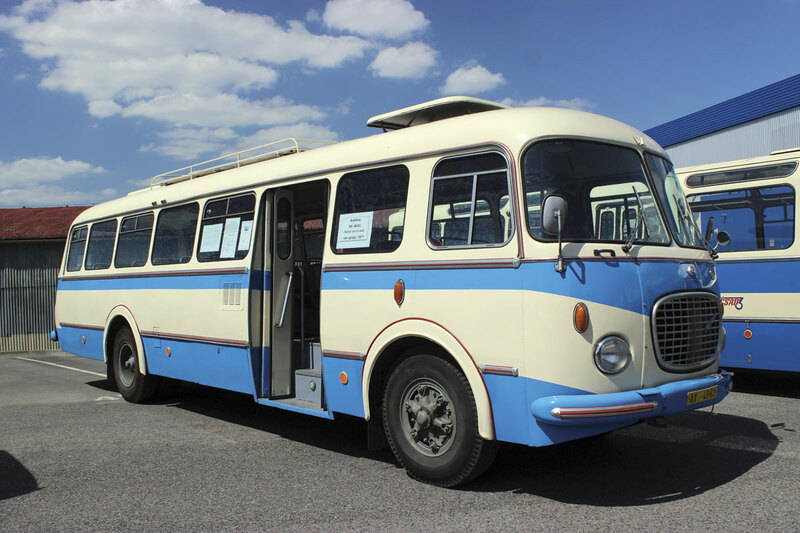 These are already offered by Brian Noone and Minis to Midis with Turas 700 coachwork and through the associated Moseley group of companies with Sitcar Voyager coachwork. The Czech Republic has an enviable engineering heritage and (I was told) was the ninth most industrialised nation in the world prior to the start of the Second World War. Illustrating the point, a display of preserved vehicles accompanied members of the current bus and coach range and examples from the Iveco truck and CNH agricultural product families. As well as some fine preserved Karosa products, the line up included various pre-war Czech car makes with Josef Sodomka coachwork and a 1928 Skoda bus/fire engine. It was in 1895 that Josef Sodomka started his company, initially as a wheelright but developing that into complete carriage building. It was 1925 before he started manufacturing automobile bodywork and not until 1928 that he built his first bus. 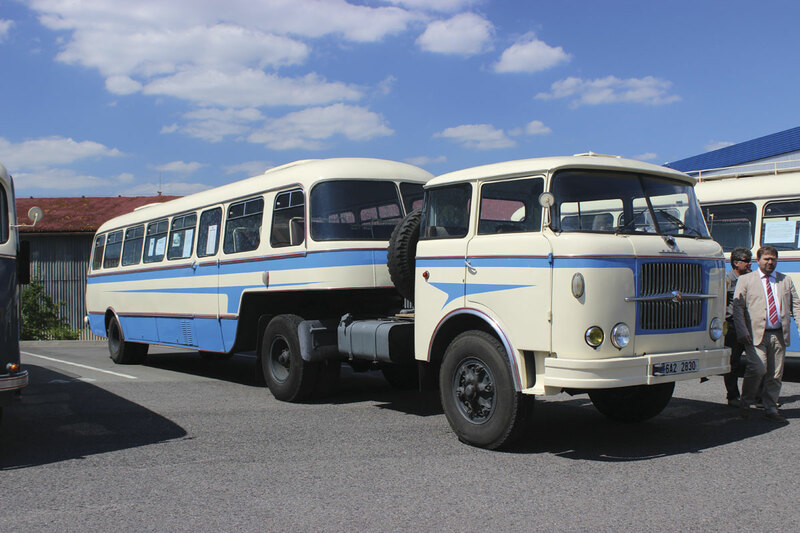 After WW2, the 706RO bus, with its rounded appearance, was introduced and the following year the business was nationalised under the Karosa brand. A decade later, the 706RTO range was launched, followed by the Karosa SM in 1965 and the 700 series in 1981. In 1993, the year that Vaclav Havel was elected Prime Minister, Karosa was privatised and acquired by Renault Véhicules Industriels. 1995 saw the launch of the 800 series and 1996 the launch of the Recreo school bus which sold very well in France. 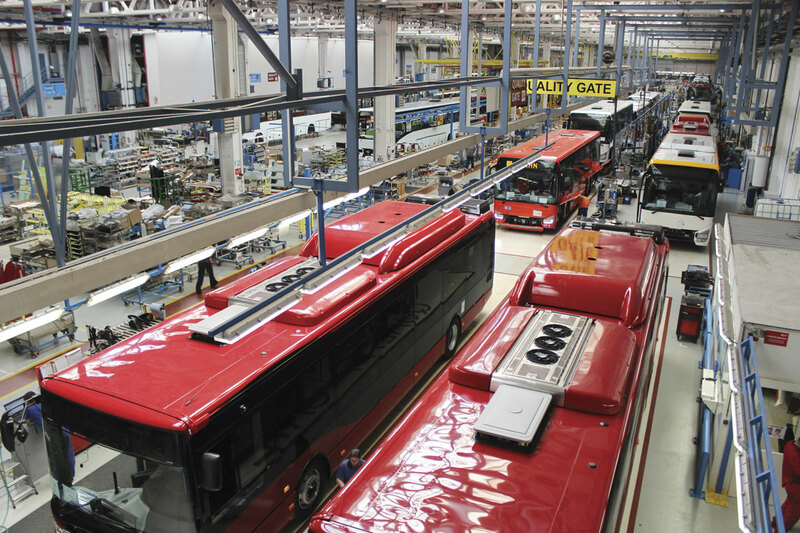 In 2001 major investment at the plant saw the construction process completely overhauled along with the installation of the cataphoretic dip facility and two years later it became fully Iveco owned. 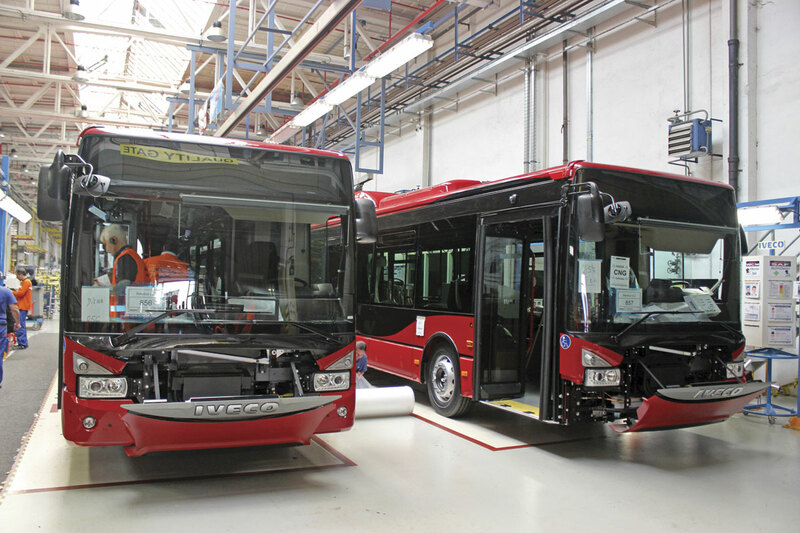 Since then the traditional Karosa designs have been progressively phased out and replaced by Iveco inspired ones as the plant has become the group’s main manufacturing site; aside from the New Daily, Iveco no longer produces buses or coaches in Italy. 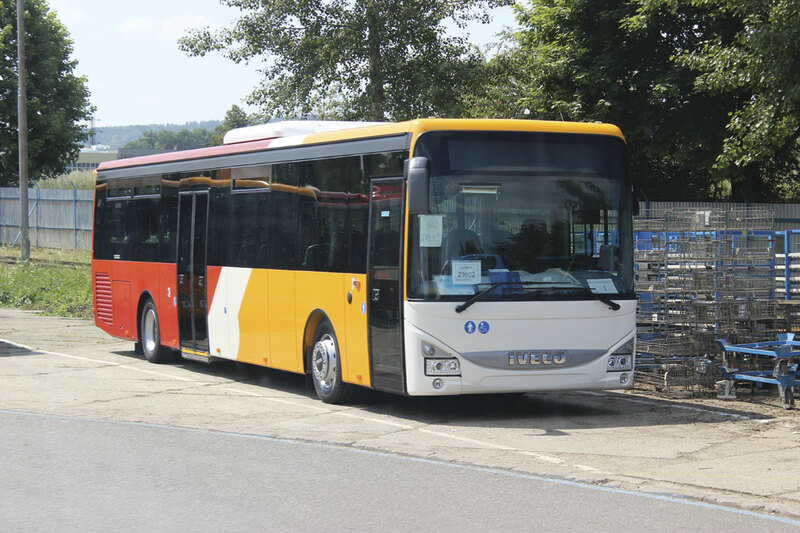 Although Iveco inspired, the Crossway and Crossway LE were both developed in the Czech Republic in cooperation with the Iveco Bus R&D Centre in Vénissieux near Lyon. A small museum has been set up on the ground floor of the multi-storey Iveco office complex in Vysoke Myto detailing milestones in the evolution of the business and displaying large scale models as well as memorabilia from the production history. It is adjacent to a guest dining area and we were lucky to be able to enjoy lunch there. 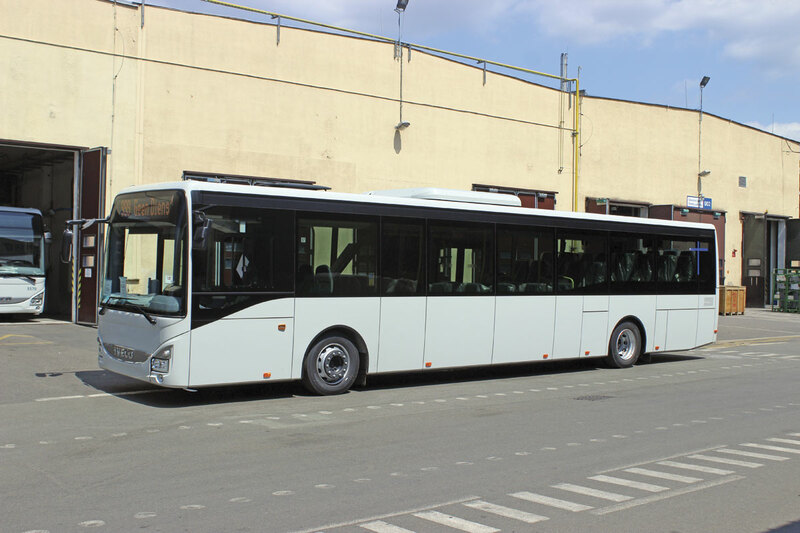 During the proceedings which involved a full orchestra and some talented acrobats, a presentation was made to Voyages Inglard, the French operator that recently took delivery of the 120,000th bus to have been built at the Vysoke Myto plant. Speaking in English, Olivier Inglard said that he bought Crossway because there was a good local dealer, the product would retain a fair residual value, he had seen increased reliability with the introduction of Euro6 and the whole of his fleet was Iveco which had enabled him to rationalise. With plans in hand to further increase capacity to meet existing demand and increase penetration of other markets, that number is set to grow rapidly and one expects that the second 120,000 will be achieved in a fraction of the time taken to reach the first. It is surprising that such a strong European brand has such a weak position in the UK, especially when it is so well represented on the truck market and enjoys a degree of residual goodwill from the EuroRider product which appears to be generally highly regarded by those I speak to who operate them, though parts support is sometimes cited as an issue. With the disappearance of the Mercedes-Benz Vario I think there has to be scope for Iveco to pick up business from UK operators, though the Daily’s 7.2-tonne GVW limit will not offer the same capacity possibilities. A real strength is its driveability and the Hi-Matic automatic transmission option which suites it to city work in a way that some competitors in the 21 to 25 seat range, notably the Optimo, can not currently match. With bigger fish to fry in sectors other than minibus, notably the potential to increase its share of the German and other key Western European markets, Iveco will continue to focus on left hand drive though in the long term, it would be surprising if a market as large as the UK did not at some stage become the focus of more attention once again.